Have you wondered how best to highlight your achievements and educational leadership activities in the new UBC Common CV? If the answer is yes, then please join INLeT for our Spring workshop, “Make your UBC CV work for you,” on April 15, from 9:30 a.m. – 11:30 a.m. in the Lillooet Room, IKBLC. This 2-hour workshop is designed to help educational leadership-stream faculty implement the new version of the UBC CV. We will begin the workshop with a panel discussion, led by experts on the intent and design of the CV, along with faculty familiar with its use in tenure and promotion decisions. Panelists will include: Melanie Jones (SAC), Jackie Stewart (Chemistry), Sally Hermansen (Geography), and Steve Wolfman (Computer Science). If you have a question you would like the panelists to address, please e-mail your question to Allen Sens at asens@mail.ubc.ca. The panel discussion will be followed by a small group activity where participants will have an opportunity to interact and develop approaches to their own CV. Please bring one or two items that you’re not sure where to place on your CV, or that you would like feedback on helping to frame so that they fit in a particular part of the CV. Join us for our first educational leadership event of the 2015-2016 academic year, a panel led discussion, titled “Taking your teaching beyond your classroom: Teaching practice and educational leadership.” This event will take place on Monday, November 30th from 2:30-4:00 pm in the Dodson Room in the IKBLC. Come and learn more about how UBC faculty work to make an impact beyond their own classrooms by incorporating technology into their courses, engaging students in experiential learning opportunities, and working to help international students transition successfully to UBC. Catherine Rawn, Christina Hendricks, Sunaina Assanand, Allen Sens, and Joanne Fox will present diverse examples of student-centered educational leadership initiatives. 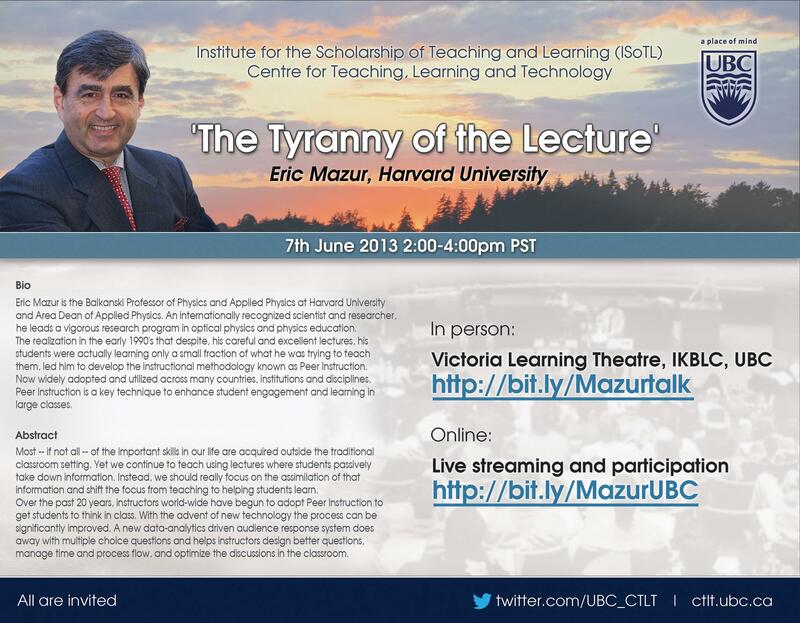 UBC’s Institute for the Scholarship of Teaching and Learning presents Eric Mazur, who will be speaking about “The Tyranny of the Lecture.” Click the image to read the details. Note the option to watch the live stream! Simon Bates has invited you to participate in a session titled ‘What Flexible Learning Looks Like’ on Wednesday, May 8, from 10:30-12:30 in the Earth Sciences Building (2207 Main Mall) in Room 1012 (you can find more information and register here http://www.events.ctlt.ubc.ca/events/view/2439). Faculty and students will share examples of work being done in the area of Flexible Learning across campus. Participants will have the opportunity to ask questions of the speakers and the Flexible Learning Implementation Team and to discuss the support available for course redesign. Professor Toope will also speak at the event. Hello Instructors! In case you are interested (or know a colleague who could benefit), there’s an Instructional Skills Workshop coming up April 9, 10, and 11.